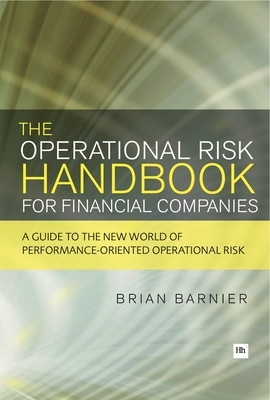 The Operational Risk Handbook for Financial Companies is a groundbreaking new book. It seeks to apply for the first time a range of proven operational risk techniques from other industries and disciplines to the troubled territory of financial services. Operational risk expert Brian Barnier introduces a range of sophisticated, dependable and - crucially - approachable tools for risk evaluation, risk response and risk governance. He provides a more robust way of gaining a better picture of risks, shows how to build risk-return awareness into decision making, and how to fix (and not just report) risks. The practical importance of fully understanding and acting on risk to the business begins in the foreword on plan-B thinking, penned by Marshall Carter, chairman of the NYSE and deputy chairman of NYSE Euronext. The book is unique because: - It is not just about modeling and a few basic tools derived from regulatory requirements. Instead, it looks at management of risk to operations across industries, professional disciplines and history to help ops risk leaders become aware of the entire landscape of proven experience, not just their own conference room. - It is not just about compliance. Instead, it looks to operations as part of performance - managing risk to return for shareholders and other interests (e.g. guarantee funds). - It is not content to look at risk in stand-alone segments or silos; instead it takes a systems approach. - It is not just about ops risk leaders sharing war stories at a conference. Instead, it introduces a panel of six financial institution board members who get risk management and provide their perspectives throughout the book to encourage/demand more from ops risk to meet the needs of the institution in the world. - It is not a semi-random collection of tips and tricks. Instead, it is grounded in a risk-management process flow tailored to financial companies from a range of proven experience, providing tools to help at each step. Suitable for companies of all sizes, this book is of direct relevance and use to all business managers, practitioners, boards and senior executives. Key insights from and for each are built into every chapter, including unique contributions from board members of a range of companies. The Operational Risk Handbook for Financial Companies is an essential book for making better decisions at every level of a financial company; ones that measurably improve outcomes for boards, managers, employees and shareholders alike. Brian Barnier uses his cross-discipline, country and industry practical experience to help leaders improve their personal and operational risk program efficiency and effectiveness. In addition, he has been honored to serve on several best-practice committees, developing risk-return management approaches that address both compliance and performance. He was named one of the exclusive Fellows of the Open Compliance and Ethics Group (OCEG). Mr. Barnier is a contributor to Risk Management in Finance (2009) by Wiley & Sons. He is a co-author of ISACA's Risk IT based on COBIT Framework and Practitioner's Guide, a member of the review committee for OCEG's Redbook 2.0, the leading best practice in business-level governance, risk and compliance, and a member of the Shared Assessment Program's Agreed Upon Procedures Committee. He has presented popular podcasts, is regularly quoted in the risk and financial press, and has over 100 published articles for business operations, finance, technology, audit, risk, security and business continuity audiences.